After battling a severe drug addiction, former Alice in Chains vocalist Layne Staley passed away in 2002. AIC as everyone knew it was over. Its heart, its voice, was gone. The band, who last released a studio record (‘Alice in Chains’) in 1995, was on hiatus (and has been for 14 years), and the death of Staley was to serve as the final stop for AIC. That was 2002 and this is 2009. Enter new vocalist, friend of Jerry Cantrell and Comes with the Fall vocalist, William DuVall. Enter ‘Back Gives Way to Blue;’ merely the bands fourth studio release in their near 20 year existence. Everyone assumed the band was done, but everyone was wrong. With DuVall, the band does not lose much vocally, and are back, perhaps better and stronger than ever before. 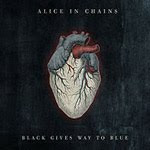 In the five minutes span of the opening track (‘All Secrets Known’) of the bands’ latest, ‘Black Gives Way to Blue,’ all doubts that the seminal grunge rock band has lost a step are lifted. It is clearly evident that they are poised to reclaim their alt-rock throne. ‘Black Gives Way to Blue’ is an opus – a jewel encrusted oeuvre that has to immediately be considered among the bands finest works. This record is proof positive that Alice in Chains can still chug through the proverbial sludge with the best of them (‘Last of My Kind,’ ‘Acid Bubble’), go away for a decade and a half, come back, and still write one of this years’ paramount rock singles (‘Check My Brain’) and cut through the noise with emotional precision and unmatched deliverance (‘When the Sun Rose Again,’ ‘Private Hell,’ ‘Black Gives Way to Blue’). ‘Black Gives Way to Blue’ is a dense slab of sound, a true representation of what the band could accomplish when focused, something they are now more than ever. If nothing else, this record is a monumental return to form for one of, if not the, best pure rock bands the last two decades has ever seen.